Amusement parks: one part games, one part rides, all parts fun! And maybe some scary funhouses along the way. Amusement parks don’t draw in the crowds like they used to, and I have no trouble laying partial blame at the feet of electronics. 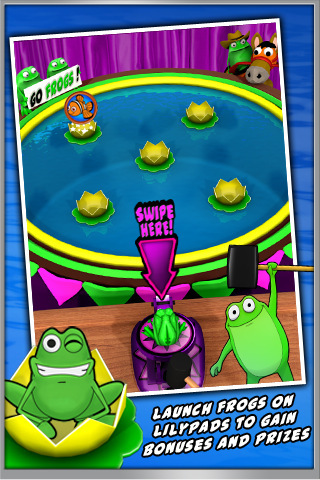 So it is with some irony that I introduce the next iPhone app, Frog Toss! by Game Circus. Frog Toss! aims to emulate a popular amusement park game of tossing objects into a floating dish: this time, frogs onto lily pads. Four lily pads rotate clockwise around a central lily pad, and you must swipe your finger on the arrow as it points to one in order to launch a frog. Shorter swipes mean shorter launches, and vice versa. Landing on a lily pad will change its color; changing all the pads to the same color will earn you a random bonus, such as extra frogs. 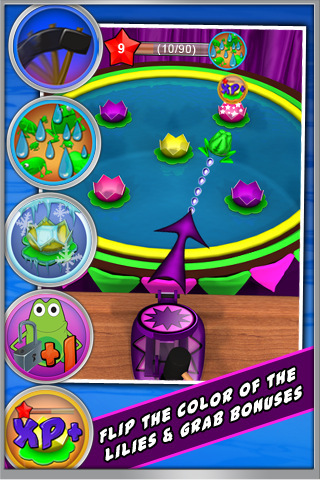 There are 20 different prizes and five five different power-ups you can collect by landing on the pad they float above, all of which will help you in your quest to change lily pad colors (example: freezing lily pads or extra frogs). Collecting whole groups of prizes will earn you a bonus. There are also swarms of flies that drift around the pads: eating them will attract more frogs to your arsenal. If you run out of frogs to shoot (and believe me, you will), don’t worry–more frogs are on the way! Frogs will accumulate whether you are online (with the app launched) or off: two per minute and five per hour, respectively. If you are too impatient to wait for more frogs, you can make in-app purchases for more through the Frog Shop. Or you could always download apps through the Free Frogs icon…completing those promotions will also garner you more frogs to toss. Collecting frogs is the most important part, because without them, the game can no longer be played. Frog Toss! has echoes of Farmville, in that action happens even while you are offline. The upside is, you’ll have a nice collection of amphibians to chuck every time you launch the game (after a goodly amount of time, of course). The downside is, there’s not much else to do in this game. You launch frogs, land on lily pads, and try to grab prizes along the way. There aren’t any levels or degrees of difficulty, although launching the frogs themselves can be frustrating. The controls for the launching mechanism aren’t very exact, and fighting with it is half the battle. The animations have a very basic 3D feel to them (I do love the peanut gallery on the side with their changing signs, though), and the colors are garish enough to be on purpose (very theme park-esque). The sound effects are what you’d expect from such a game: ribbiting, buzzing, and bells. Frog Toss! is a fun game for random pick-up-and-play, but nothing that you’d keep long-term. AppSafari review of Frog Toss! was written by Julie Guan on March 3rd, 2011 and categorized under App Store, Free, Fun, Games, Scrolling Shooter, Strategy. Page viewed 4648 times, 2 so far today. Need help on using these apps? Please read the Help Page.